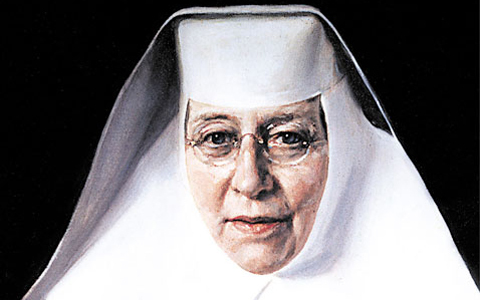 Saint Katharine Drexel was born in Philadelphia on November 26, 1858, the second child of Hannah and Francis Anthony Drexel. Hannah died five weeks after her baby’s birth. For two years Katharine and her sister, Elizabeth, were cared for by their aunt and uncle, Ellen and Anthony Drexel. When Francis married Emma Bouvier in 1860 he brought his two daughters home. A third daughter, Louise, was born in 1863. The children grew up in a loving family atmosphere permeated by deep faith. The girls were educated at home by tutors. They had the added advantage of touring parts of the United States and Europe with their parents. By word and example Emma and Francis taught their daughters that wealth was meant to be shared with those in need. Three afternoons a week Emma opened the doors of their home to serve the needs of the poor. When the girls were old enough, they assisted their mother. When Francis purchased a summer home in Torresdale, Pa., Katharine and Elizabeth taught Sunday school classes for the children of employees and neighbors. The local pastor, Rev. James O’Connor (who later became bishop of Omaha), became a family friend and Katharine’s spiritual director. She inherited a vast fortune from her father and step-mother, and spent her wealth to helping these disadvantaged people. In audience with Pope Leo XIII, she asked him to recommend a religious congregation to staff the institutions which she was financing. In 1891, with a few companions, Mother Katharine founded the Sisters of the Blessed Sacrament for Indians and Colored People. In 1935 Mother Katharine suffered a heart attack. She spent her last years to Eucharistic adoration. She died at the age of 96 at Cornwell Heights, Pennsylvania, on 3 March 1955.